Blue Devils rebound from 6-5 loss with 10-2 nightcap win – Welcome to Wyandotte Daily! Bouncing back from a disappointing 6-5 loss to Ellsworth Community College Friday, Kansas City Kansas Community College needed just five innings for a 10-2 second game win. 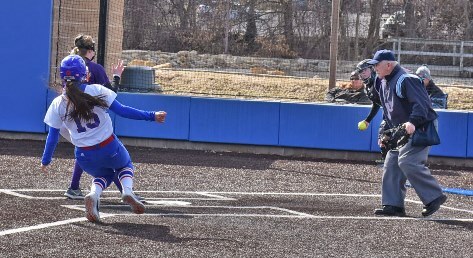 The win improved the Blue Devils’ record to 6-4 heading into Jayhawk Conference play against Cloud County today at 2 and 4 p.m.
KCKCC is also home Sunday against Southwestern Iowa at 2 and 4 p.m. and North Arkansas Monday at 1 and 3 p.m. All three doubleheaders were originally scheduled to be played on the road but were all moved to take advantage of KCKCC’s all-weather field. Freshman Shaylun Grosstephan of Girard shut down Ellsworth in the 10-2 nightcap, scattering five hits, striking out five and walking one for her third win of the season. Leading 3-0 after one inning, the Blue Devils had their lead cut back to 3-2 in the third before scoring three times in the fourth and then closing out the win with four runs in the fifth. Four Blue Devils had two hits. Sophomore Kaylee Arnzen and freshmen Alaina Howe and Hannah Redick each doubled and singled and Grosstephan singled twice. Howe and Redick drove in two runs and Arnzen one. A seventh-inning rally came up a run short in the 6-5 loss. Trailing 6-3, the Blue Devils scored twice but couldn’t overcome a game-winning 5-run Ellsworth rally in the fifth. Freshman Mackenzie Pinkerton (2-3-1) worked into the fifth, allowing five hits, walking three and striking out six. Grosstephen finished up, allowing one run on three hits and a walk. She struck out two. Sophomore Kaylee Arzen led the Blue Devils, driving in three runs with her second home run of the season and a single while Redick singled and doubled and drove in one run.